The N410 batch controller distinguishes itself by its user-friendly features: Numerical keypad, clear programming menu structure, easy to read display and simple mounting enclosure. The numerical keypad allows simple and fast changing of the preset batch quantity. Fluidwell stands for simplicity and reliability and it is now available in this customer focused and application driven batch controller. 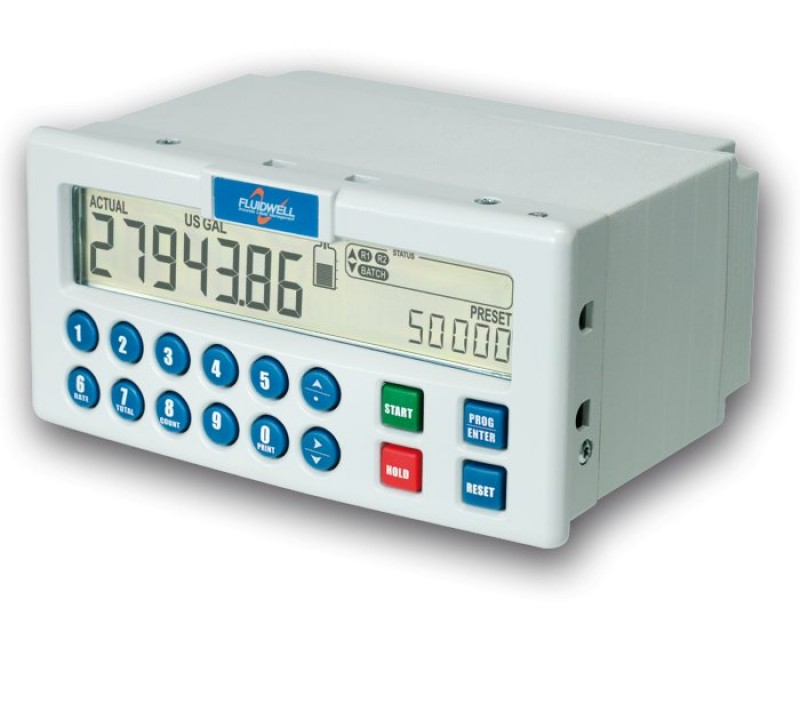 The N Series from Fluidwell saves time and cost with the easy to operate numerical keypad. Your team members are in control with our highly praised “know one, know them all” configuration structure, saving time, cost and aggravation. Key information at a glance as the display simultaneously shows actual value, preset value, batch process indication, switch point indication and measuring units. Easy installation with the rugged aluminium DIN-size panel mount enclosure. Shows actual value, preset value, batch process indication, switch point indication and measuring units simultaneously. Five control inputs for remote START, HOLD, RESUME, keypad lock and external alarm. 7 large digits (14mm, 0.56″) for actual value, flow rate and total. 10 smaller digits (8mm, 0.3″) for preset value, accumulated total and batch count. Selectable on-screen engineering units for volumetric or mass: L, m³, USGAL, IGAL, ft³, bbl, kg, Ton, lb. Easy operation to enter a batch value and to control the process. Ambient temperature: -20°C to +60°C (-4°F to 140°F). Aluminium IP67 (NEMA4X) DIN front panel of 144 x 72mm (5.67″ x 2.83″). Accurate batching or filling of liquids where the batch size changes frequently. The Fluidwell N410 offers the perfect solution for batch control applications where a user friendly instrument is required. Whether you focus on its clear display information, the very easy to operate numerical keypad or the easy menu-driven configuration structure, Fluidwell is always your first and best choice. For analogue inputs we offer our F-Series and D-Series batch controllers. For intrinsically safe applications we offer our field mount F-Series indicators. We’ve got a great new Fluidwell configurator tool to help making your decision that much easier. Why not head over to the Guides and Tools section of the site and take a look now! If your organisation requires five or more N Series units, please contact our team of experts for a quotation. Minimum 0Hz – maximum 5kHz for total and flow rate. Maximum frequency depends on signal type and internal low-pass filter. E.g. reed switch with low-pass filter: max. frequency 120Hz. EMC Directive 2004/108/EC, FCC 47 CFR part 15. Low voltage Directive 2006/95/EC. IP & NEMA EN 60529 & NEMA 250.